Author Gay Toltl Kinman is my first children’s mystery writer, with ten books so far in that arena. But she is also a playwright, a teacher, and an incredibly prolific writer of both fiction and nonfiction. We talk about so many interesting things, I’ll see if I can squeeze them all in the show notes. First off, here is Gay’s Author Page on Amazon and here is the link to some pics of Gay on her many adventures — including one taken in Alaska by the real Alison, the inspiration for her series. And let’s not forget to link to Hearst Castle, the inspiration for her first YA novel, Wolf Castle (fka Castle Reiner). Gay’s second mystery series for children, The Adventures of Lauren MacPhearson, is also inspired by another granddaughter. Both the real and fictional Laurens barely spoke at all, and yet both have had marvelous adventures. For more information on Elective Mutism (now called Selective Mutism), check out the American Speech-Language-Hearing Association. 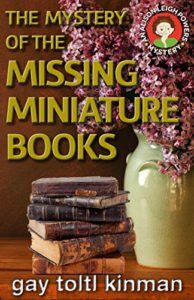 Gay worked with miniature books at the spectacular Huntington Library, and that experience was the inspiration for The Mystery of the Missing Miniature Books. If you like mysteries where you learn something new, this one fills the bill. I had never imagined there were so many rare and antique books under four inches tall. Here’s a link to the Huntington’s own collection, but if you want more details, check out the Miniature Book Society. It’s impossible to talk about children’s mysteries without a nod to Carolyn Keene. Both Nancy Drew and The Dana Girls mysteries were written under that name. And I gave a shout-out to Shoshona Freedman. When we talked about Gay’s work as a playwright, she gave a shout-out to South Coast Rep and Cecilia Fannon. Here is a link to the video The Read, the cold reading Gay talks about, of her play on Grace Nicholson. Up next is her book on women heroines, featuring never-before-published material from letters and journals, and includes a vignette on Julia Morgan, architect of the Hearst Castle. Which brings us back full circle to Gay’s original inspiration. We did it! As always, if you’d rather read than listen, here is a transcript. Laura Brennan: My guest today is Dr. Gay Toltl Kinman. Her career is nothing short of epic: ten children’s books, a YA gothic novel, several adult mysteries, two nonfiction books, numerous short plays and short stories, three Agatha Award nominations and an EPPIE win. Add to that over one hundred and fifty articles in professional journals and newspapers, book reviews, a children’s book column, a teaching load that includes law, library science and writing, and I simply don’t know how she has time to chat with me. But I’m glad she does. Gay, thank you for joining me. Gay Toltl Kinman: Well, thank you for asking me. LB: I barely know where to start here, so let’s first talk about you. You have a Master of science in Library Science, right? LB: Did you always want to be a writer? GTK: Yes, I did. Because my mother was also. But it seemed to me so lofty and esoteric to say that I wanted to be a writer, so I don’t think I ever said that I wanted to be anything specific because I didn’t really know what I wanted to do. But I knew eventually I wanted to write. LB: What was the impetus there, for that first book? GTK: I was reading a lot of Gothic novels at the time. And I had an idea for a story, because I like Hearst Castle very much and we been up there a few times, and I just thought that whole setting was so fantastic. And I was working full time, and I said well I’m going to put aside Saturday morning and I’m going to write. I tried to do that but it’s just impossible. So I did write it. It was originally called Castle Reiner, and then we changed it with the second publisher of the book, we changed it to Wolf Castle because it involves wolves. So I wrote that, and then I started to write some other things. I had several things going and at one point in time I had, I was working for this crazy boss, I thought if I don’t do it now, when am I going to do it? I decided to take a year’s leave of absence. Well, as soon as I started to do that and worked on a full-time, then I was getting published more often. And I’ve never gone back to work, to that work, I’m enjoying what I’m doing as far as writing goes. LB: I want to talk about your children’s books. LB: You have a couple of series in the mystery realm, the Alison Leigh Powers series. Let’s talk about them first. They are just charming. They’re appropriate for 10- and 11-year-olds, but they never talk down to them, they’re very smart. So how did you decide to start writing for children? GTK: Alison is our granddaughter. We took her on a Rhodes Scholar Intergenerational trip, and she is the feistiest thing. So she is a real character, and I don’t mean that in a negative sense. I mean there’s something to her. 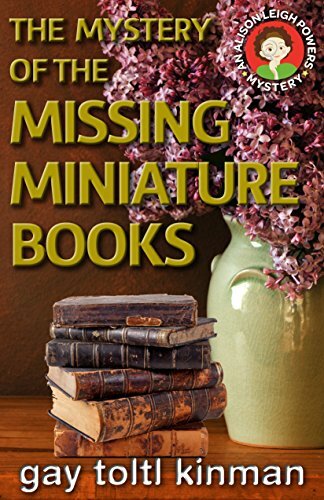 I wanted to do the miniature books because I had worked at the Huntington Library here in San Marino on the miniature book collection and they are absolutely incredible. And I wanted to do something with those miniature books. So the titles in the story are real titles that the Huntington has, books that actually exist. The story just came out, I had no plan, no plot outline or anything. I don’t outline, and I know half the writers do and the other half do not. So all of the stories were centered around Alison, as I say, who is really a marvelous character to write about. Lauren is another granddaughter, and she lived two of those stories, we were at the camp, the dude ranch, she was actually they are. So I used some of that, some of the things that happened, which really did happen. And then eventually used her for some of the other stories I had in mind. LB: That’s really interesting, because The Adventures of Lauren McPhearson, that has a very unique heroine. Lauren is just the name of your granddaughter, or does she, does your granddaughter also not speak? LB: Your actual granddaughter didn’t? GTK: No, she didn’t. She hardly talked at all. So I made her mute, but it’s elective mutism. It exists. Ironically, I dedicated the book to a girl and I actually met her at the Los Angeles Times Book Festival. She did not speak, and her grandmother was there telling me about the girl, and I said, well I’ve got a book that’s coming out next year. It really exists. There’s lots of reasons for it, and one of the reasons I gave in the book as to why she didn’t talk, but other kids just feel there’s no point in talking so why bother? It’s a very interesting phenomenon but thank God it goes away eventually. LB: That is fascinating. I had never heard of that. What is it do you think about mysteries that kids just love? GTK: You want to find out what happened. I just finished a Dana Girls book, written in 1942. It’s called The Portrait in the Sand, by Carolyn Keene. But you’re turning the pages to find well, why is the portrait in the sand? And why isn’t it there the next day? So you’re turning the pages to find out about this riddle or this puzzle. To me that’s the interesting part of mysteries. LB: Now is that what made you want to write mysteries? GTK: Yes! Yes, that’s the reason I want to write them. Yes. LB: So, you’re also a playwright. GTK: Yes. Ten-minute plays is a genre, and I took a course, two courses at South Coast Repertory from a marvelous playwright, Cecilia Fannon, she is just a marvelous person and a marvelous playwright. And I wanted to find out what the form was and more about it, because I had written this, I started to write these plays, then I learned about the ten-minute genre, which was just absolutely perfect for me. And I don’t know if I sent you this, another play was done about Grace Nicholson, who was the founder of Pacific Asia Art Museum in Pasadena here. And in the story, the turning point is she goes from selling Indian artifacts, which she loves and is very familiar with, to Asian goods, jade specifically. And she has to make this decision, to do it or not. Her companion, her friend, her chief buyer — they were not lovers, they were good friends — she doesn’t think he’s going to go along with her on this. Anyhow, the play’s about that. A group here televised it. They did a cold reading of it. And playwrights love cold readings by actors. Actors hate them. Anyhow they did that. 10 minutes, cold reading. Then we had the 10 minute discussion, then the final 10 minutes was the final play, prepped, practiced, rehearsed and all of that. GTK: I remember the first play I wrote for Cecilia, it was called The Wishing Well. And it has to do with Coyote, who’s a trickster in the Southwest. And he is selling wishes. And so the first man comes and he says, I want a wish, I want this lady to marry me, so here’s my money and please put that in. So Coyote writes it on a stone, throws it in the well, and then he notifies the woman and says, this man has put a curse on you. So give me some money, and I will eradicate the curse. It’s been done about five times. Every time it’s different. I can’t tell you how, how exciting it is to watch the play, your words, but they have taken these words and done something else with them. Created another world. And I just sit there with my mouth open because as I say, it’s different each time. Which is very exciting. LB: So is theater really the thing you enjoy the most? Because you do so much, oh my gosh, you teach, and you write books for children, books for adults, you write nonfiction and short stories. Is there one genre that you are more, one medium that you like better than the others? GTK: I don’t have a particular favorite genre. It’s what story I have in mind — and I don’t want to make this sound mystical or anything — it will tell me what form it supposed to be in. Death in Russia, which is a short story, I wanted to do more with it but there wasn’t anything necessarily more to the story that would be interesting. So I made it into a short play, a ten-minute play. And when you change the form, you change the story, too, because different things happen. And sometimes the ending isn’t the same. LB: You told me you’re working on a new book, a nonfiction book, which is awesome, a children’s book. GTK: I’m working on a children’s book about, a nonfiction book, about women heroines using original materials. They’re like diaries and so forth, but the vignettes will only be two or three pages long. But it’ll be things that have never been published before, either because they’re too short — for example, Julia Morgan has a couple of letters there that have never been published. LB: Is that something big in the library community that you guys worry about? GTK: Absolutely. And it happens all the time. And they have policies in place to try to prevent any kind of theft. From the Huntington, from any research facility where you cannot check out materials, yes. And there is no inventory, you can’t go through every file folder and count the number of pieces. So I don’t know what the statistics are, or if anybody does, but all the major research libraries have losses. LB: Do you have like a dream project that you really want to do? What’s motivating you to keep writing? GTK: It’s what I love to do. So, if you like to play tennis, than that’s what you do. You love to play tennis, you play tennis all the time. I love to write, so that’s what I do. My projects are, I have a series of stories called Vengeance is Mine. And it’s about two police officers, two female police officers who have retired from LAPD and they’ve opened this PI agency, and they do unusual things. They get justice for the person who is paying them. And their fee is very high. I haven’t named with the fee is, because in 10 years, it won’t be high. So I have a series of short stories, three of those have been published, some going to try to put together enough short stories for a book. So that’s one thing. All of my plays, I would like to publish in a book. I’m working on the index to that; I have one more play, and then I think we can go ahead and put that book out. And then I have a series of stories about an LAPD officer Agnes Graham and a PI she works with. So there’s a book, I have a book ready to go. I need to let it marinate a little bit longer, and then I will revise that. So there’s about three short stories, one was published in a Sisters in Crime anthology. They’re long stories, so possibly three, probably four, will make a book of her exploits. And then I have another series, Stand Down, about an Afghanistan vet, a woman who lost her legs and she is coping with life. So I’ve got six stories in that, four have been published, one is finished but it needs be gone over again, and the sixth one is not finished. So I’ve got those collections of short stories that I’m working on and the play index. LB: That’s incredible. How do you juggle everything? Because you also have a teaching workload and you do so much research and professional work. How do you juggle it all? GTK: I’m not teaching anymore, but I do do classes occasionally. And I do a workshop on how to write a mystery, and it’s an interactive workshop and it can be done for any age. I’ve done it in the schools, as low as the second grade. They come up with the crime, and the crime was Grandma’s Viper was stolen. I had no idea what a Viper was! But I figured it out, it was a car. It was this kid in the second grade who comes up with this. So they all came up with the plot, they were absolutely fabulous. And I taught at Cal State San Bernadino, I taught library science and I’ve taught paralegals and writing. So it wasn’t just the writing. LB: Right. Your doctorate is in law, right? GTK: Right, it is, yes. But I am not an attorney. LB: Did you do it in order — I mean, my only reason to think about going into law is to get the details right for mysteries. GTK: Yes, and that has been so helpful! And I’ve also worked in the police department, and that has been very helpful. Getting those things right. Otherwise you don’t know what the procedure is. And if I read something and that would not happen — but it might happen in a small town. You can pretty much do anything a small town. Not necessarily wear booties and gloves when you go to a crime scene. I have a friend who’s a CIA agent and he didn’t write about the CIA. He came out with this series about, set in 1860 or something about a sheriff. And I said, what happened? He said, I’m just too close to it. I can’t write about it, I want to write about these other things. LB: I interviewed Shoshona Freedman, and she had worked as a private investigator, but that is not what she wrote about. LB: Gay, thank you so much for joining me today. GTK: You’re welcome. Thank you my dear.